Hurricane Harvey left Houston and surrounding areas in shambles. Residents lost cars, homes, houses of worship and worst of all — some lost their loved ones. The images reminded many of Hurricane Katrina’s destruction in 2005 in that those affected were once again disproportionately black and brown. And many of those who were unable to evacuate or get out were tragically poor women and families of color. But as the nation’s fourth largest city begins to rebuild, a brigade of everyday citizens has been compelled to lend their help to the cause. “When we got on the ground just a few days after [Hurricane Harvey] hit, my immediate feeling was of survival—like I had landed in a combat zone. I went into triage, crisis management and recovery mode,” said K.C. Fox, founder of The Lady General Foundation and the “Helping Houston” Dallas task force. Fox and her co-founders — attorney Lee Merritt, business mogul John H. Dixon III, and social activist Corey Hughes— made their first deployment to Houston and Beaumont, Texas, just days after the storm hit. “We are empowered as a people, we do have the power and the influence to get these things done. We helped well over 6,000 people in 5 hours. We have the power to shape our own destiny—we do it with boots on the ground,” said Fox, a former Air Force Sergeant who was wounded in Iraq. 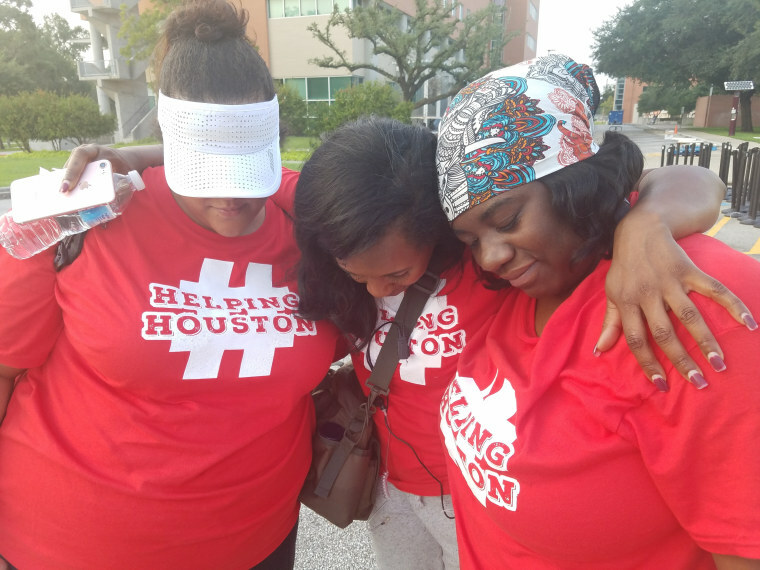 She and her cohorts did something amazing within days after Harvey made landfall: their initial convoy to Houston included 25 vehicles, consisting of an 18-wheeler loaded with requested items, three 26-foot U-hauls, two box trucks, a mobile medical RV, mobile barber and beauty RV, and several charter buses transporting goods and volunteers. The Dallas based task force enlisted over 200 volunteers, including people who travelled from across the country to assist. Since their initial foray into Houston, the task force has garnered over $3 million dollars worth of goods and services, delivering 10-15 thousand packages every two days. The task force also deployed resource services consisting of clergy, attorney, barbers, nurses, psychologist, sociologist, baby sitters, chefs, financial and mortgage professionals. “We have the ability to help ourselves, we can do it ourselves. We must take responsibility for our own community and be the change we want to see. We are on our own now—we are powerful. It's on us and we got it,” said Merritt. An attorney well known for taking civil rights cases, including the young black man falsely accused of being the Dallas sniper in 2015 and heart-wrenching cases like that of 15-year-old Jordan Edwards, who was shot to death by police while sitting in a car with friends in 2017. Although recovery efforts have now shifted to hurricane relief in Florida, the Caribbean and soon Puerto Rico, Houston must not be forgotten. It is critical to the rest of the nation because it is a diverse and international city with stellar universities, biomedical research, and energy producing industries. For example, over 30 percent of the nation’s oil and gas comes through Houston. The lift is a heavy one. But beyond groups like the one formed by Fox, and Beyoncé’s Relief efforts, the black women’s Greek lettered organizations are also stepping up in a big way. Alpha Kappa Alpha Sorority, Inc., announced that it will still hold it’s 68th Boule in Houston, Texas next July despite the Hurricane. “We are women doing God's work. We are an organization that grew up with this country---as the nation goes so goes AKA. We are going to be in Houston for the long haul. At the end of day, we are in this together…We are all connected,” said Dorothy Wilson Buchanan, International President of AKA. The Houston region is special to the AKAs. Two of their past National presidents live in Houston and thousands of their members were impacted by the storm. To date, AKA has donated $100,000 in direct relief to the Mayor’s Fund and regional efforts, with another $50,000 coming. Through their 29 Moments of Service leading up to the 2018 Boule they will first provide back packs to school children filled with nonperishable food and personal grooming items. And in phase two they will assist with school uniforms and clothing, shelter and feeding families. We don't have to wait for others to help us, or the government, Red Cross or FEMA. We can pick each other up ourselves. The sisters of Delta Sigma Theta Sorority, Inc. are helping too. “Delta has witnessed the desolate effects that the recent disasters have had on our members and our neighbors in locally impacted communities,” Delta president Beverly Smith wrote in a statement to NBC News. “Through the DST Disaster Relief Fund, Deltas have provided over $60,000 in direct aid to impacted individuals in Texas.” Additionally, members have donated necessities to local chapters in Houston and are working with regional leadership and area partners for wide scale distribution. In the final analysis, the best and brightest in the Black community—former military members, businessmen, attorneys, clergy, social justice activists and the like have all stepped up and they do so with the backdrop of Katrina and painful lessons learned. But be clear: it’s black women who are leading the way. Perhaps, the most powerful take away from this tragedy is that many in the black community have realized that their destiny lies in their own hands. That beneath the rubble lies respect, restoration, and rebirth.